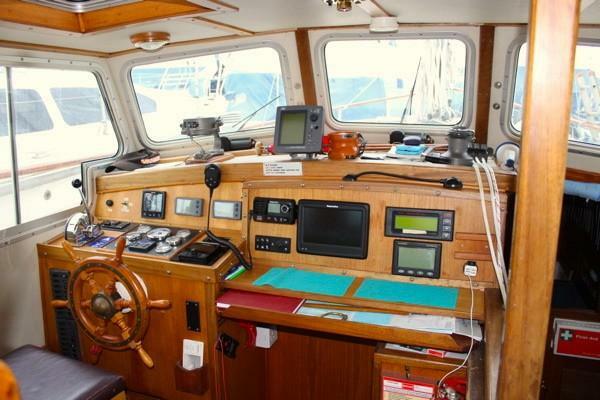 Tough, hard chined triple keeled 36ft steel hulled cruising ketch with enclosed wheelhouse and aft cockpit. Accommodation for 4. 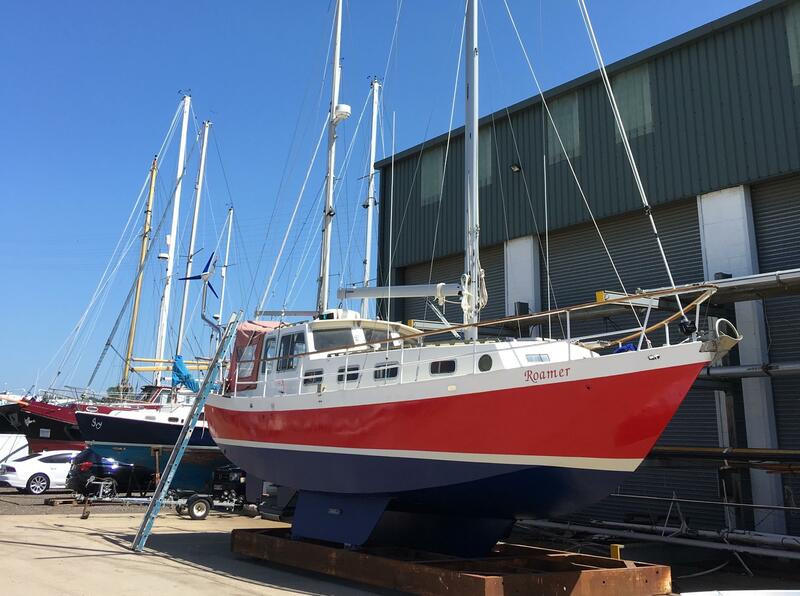 New engine 2013, thoroughly updated in 2017/18 by Fox's Boatyard for the owner with new sails, furling main mast & rigging, electronics and much more. 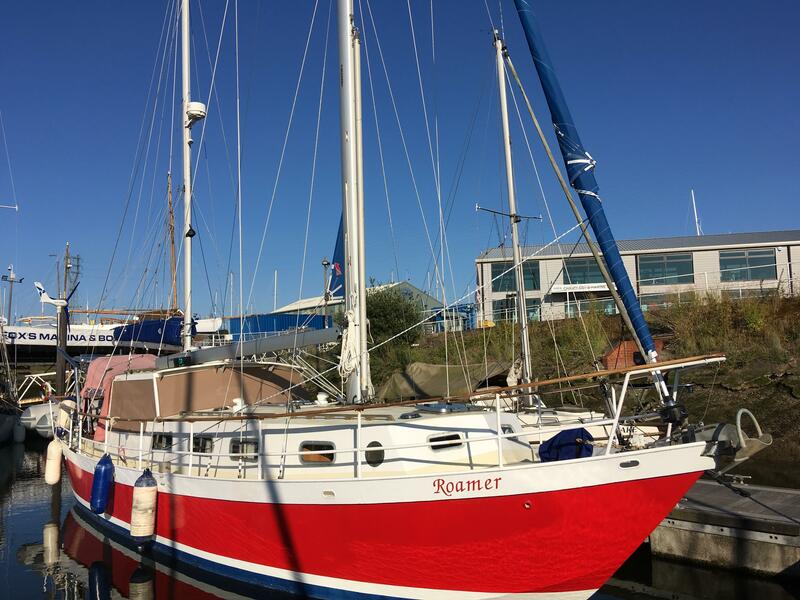 Designed by Munslow and Jackson, built by Roamer Boat Sales of Sandwich in 1983. Major re-build completed 2004 and again thorough updating in 2017 and 18. 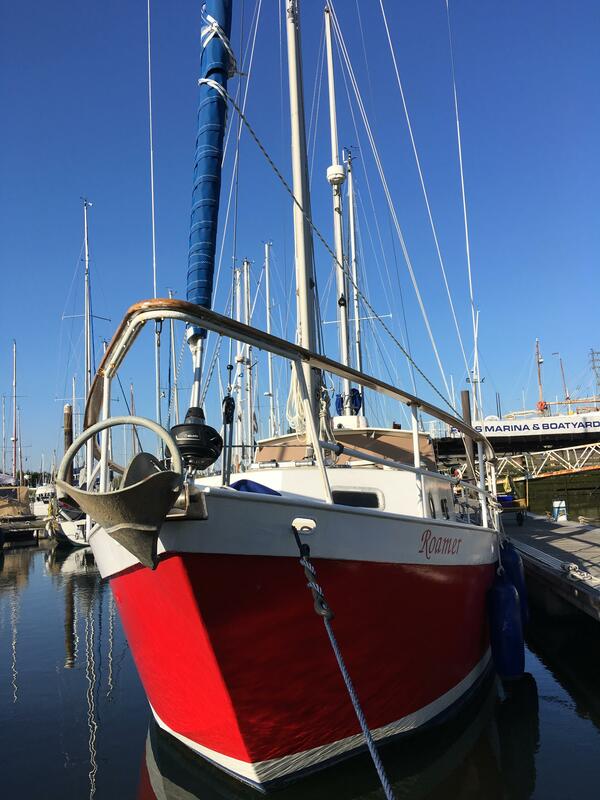 Red painted chined steel hull with white boot top. 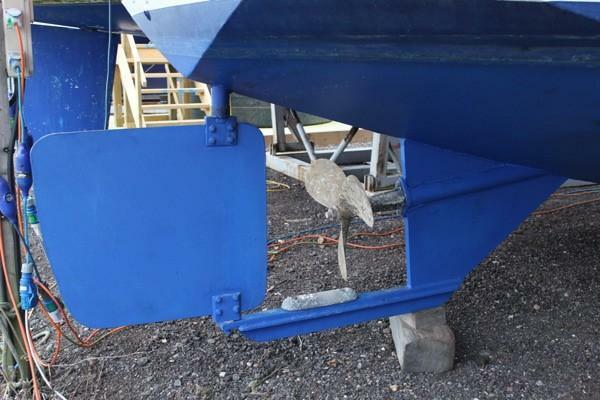 Long centre keel with encapsulated ballast and bilge plates p&s. Cream painted 5mm steel side decks, blasted, primed and painted inside and out in 2004 with side deck being GRP sheathed. GRP foam sandwiched superstructure, white painted & cream non slip 2018. Self draining aft cockpit of oiled/varnished teak plus Iroko cockpit grating. 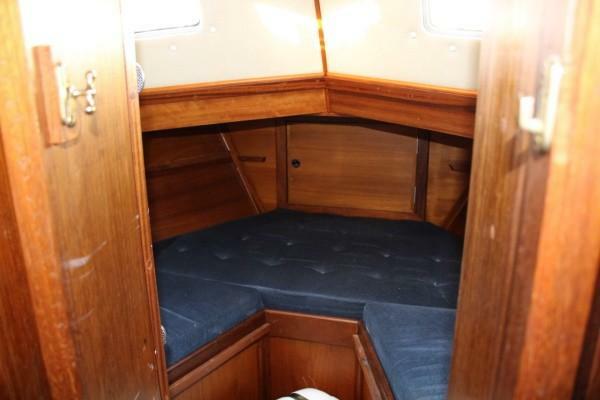 2004 interior joinery of varnished teak and Iroko with tiled surface in galley. 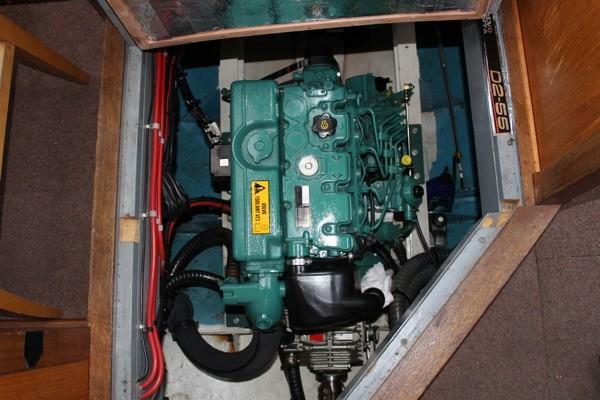 2013 Volvo Penta D2-55 4 cylinder 55hp diesel engine. Closed circuit cooling with heat exchanger and wet exhaust. 2013 Volvo Penta MS25L-A reversing reduction gearbox with shaft driven 3 bladed propeller via a flexible shaft coupling. Single lever control – new 2018. Approx. 160 engine hours. Cruising speed 6 knots @ 2,000 rpm and max 7 knots. Fuel - 200 gallons in two pairs of nylon tanks. S/s tank lids fitted 2017. Freshwater - 140 gallons fresh water with hot and cold pressurised system. 12 Volt system - 4 batteries (engine start and 3 x domestic – 3rd new 2017) charged by engine driven alternator, 2018 Solar panel and 2017 Silentwind wind generator on s/s support with regulator. 12v LED interior lighting. 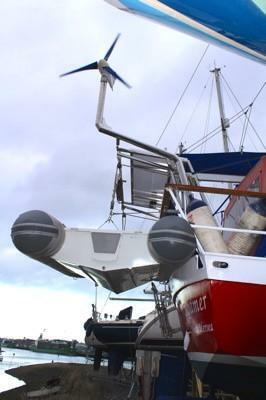 LED standard sail and motor navigation lights with deck floods to main & 2 x mizzen (2017) and tri-white at masthead. 2 electric windscreen wipers. 240 Volt system – Shore power socket and cable. 4 x 13amp sockets below. 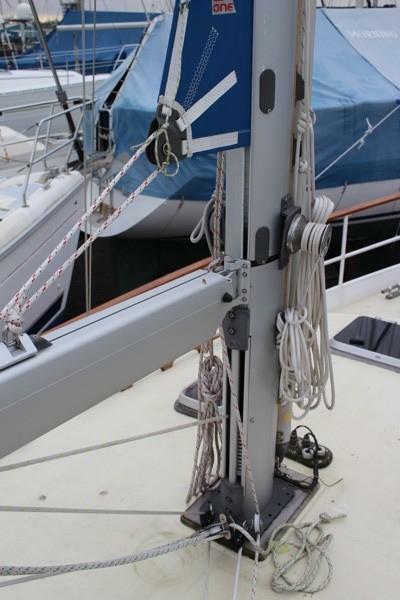 1 x 19 s/steel wire standing rigging – new 2018 to mainmast & forestay, mizzen 2011. Mainsail sheet, outhaul and furling line led into wheelhouse. Blue mizzen zip up Lazybag with Lazyjacks. 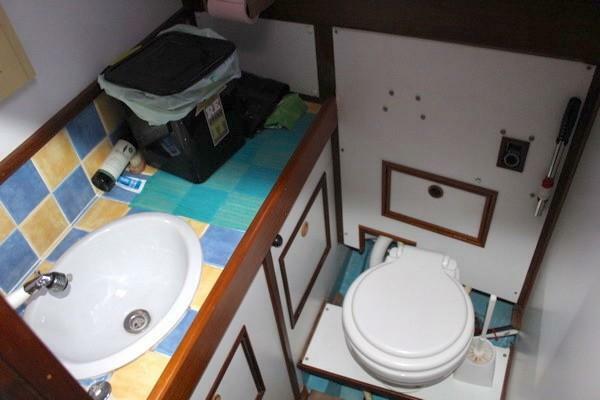 Four berths in two cabins with full standing headroom. Fwd 2003 windows and skylight in coachroof. Carpet tiles on cabin sole. 2004 Hot and Cold pressure water system (hot from 2004 Rinnai gas heater with external flue). Gas system checked 2017 with Certificate. Dickinson Newport charcoal cabin heater. Opening deck hatches to forecabin, heads, saloon & wheelhouse. 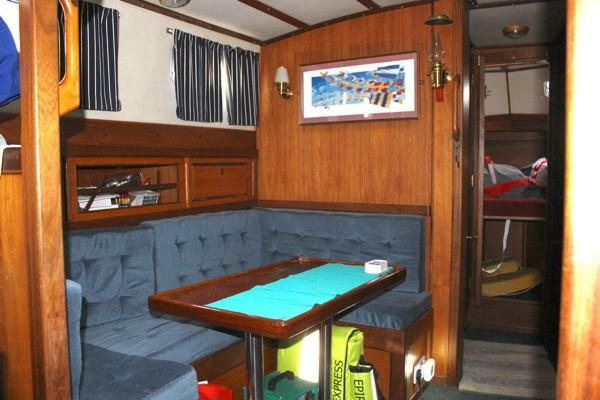 Saloon with U shaped dinette to port which can be converted to a double berth, half settee berth to stbd. 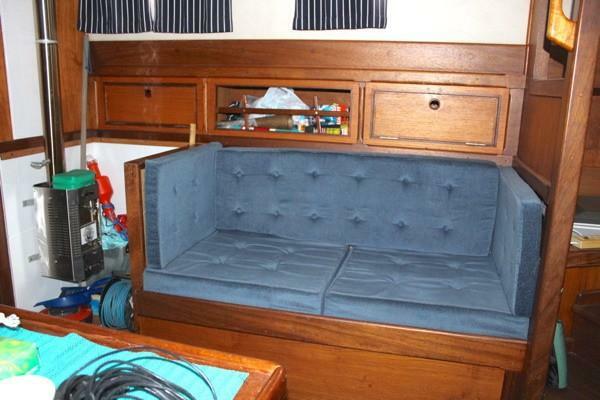 Lockers / book shelves outboard and storage under and behind settees. 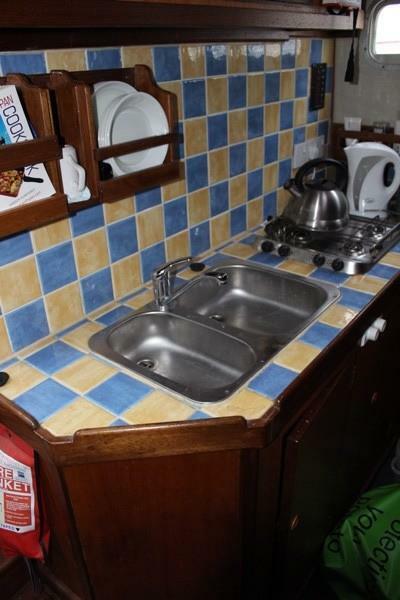 Galley – refitted 2004 – aft to port with s/steel double sink. mixer tap, h&c pressure water, tiled work surface and splash back, lockers above and below, Smev four burner gas hob. Engel swingmotor 12/240v chest fridge/freezer and excellent stowage for crockery, cutlery etc. 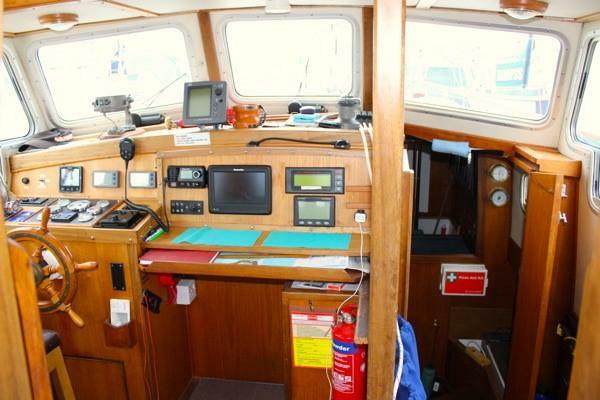 Steps up to enclosed wheelhouse with helmsman’s stool, extending chart table, instruments, electrical panels and sliding windows to p&s. Door to good size aft cockpit with stowage and gas locker. Raymarine ST40 echo sounder and boatspeed/ log. JRC 1000 Mk 2 radar. 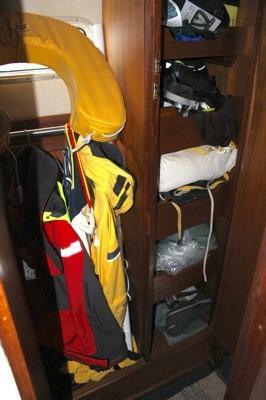 Seago 4 man canister packed liferaft – service due 2020. 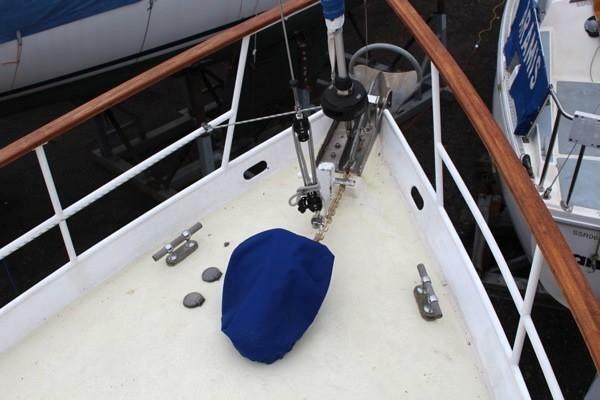 Lofrans Tigres electric anchor winch (New in 2012) with 10mm chain gypsy and warping drum. 2012 - 35lb Manson Supreme bower anchor, 40m 10mm galvanised chain & warp. 30lb CQR anchor, 12m chain and 50m warp. 2 x auto electric bilge pumps. S/steel double roller stemhead fitting. White painted stanchions and bases with Iroko hand rail and gates Port & Stb. Iroko grab handles on coachroof. 2004 blue dodgers with name. 1 x std and 1 x telescopic boathooks. Folding stainless steel boarding ladder. Cockpit enclosure tents on s/s frame. Gas locker (for 2 x 6lb Camping Gaz cylinders), Alde gas leak detector. Alloy hulled RIB tender in davits, with oars – new 2018. 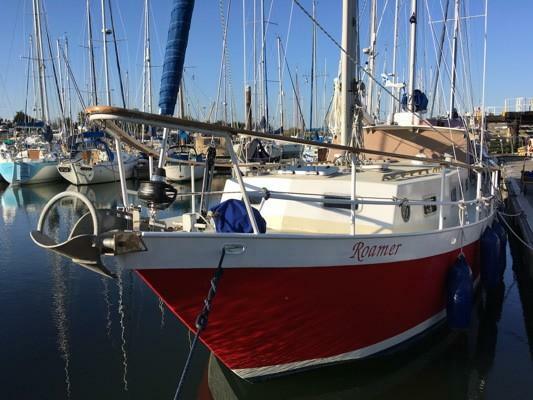 We sold her in 2016 to her present owner who has significantly updated her, for long term offshore short-handed cruising, unfortunately due to poor health this plan has been put on hold and “Roamer’ is offered for sale. 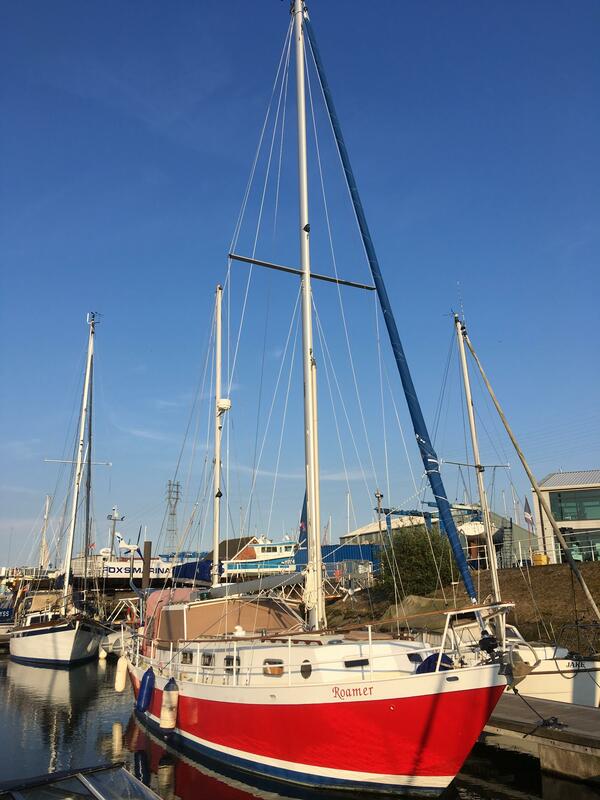 This is an ideal live aboard, go anywhere cruiser, tough enough to take the ground if required and perfect for exploring the more out of the way bays and harbours. 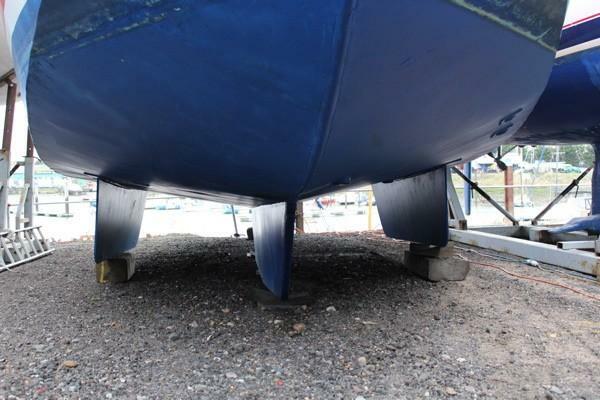 A comprehensive list of the work carried out to the yacht in her present ownership is available on request.